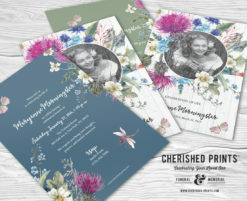 All announcement cards and invitations cards are 5" x 7", made to order, and digitally printed. The paper stock is 100# uncoated cover weight archival acid-free paper. Orders shipped directly to you or place of service. 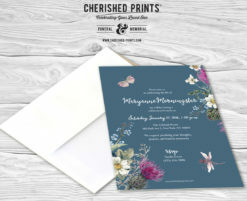 Blank white envelopes are included with all announcement card print orders. Need help with your content? We have a collection of wording examples for your announcement/invitation that can be tailored fit your event. We also offer a complete matching collection of programs, prayer cards, memorial cards, bookmarks, acknowledgment/thank you cards, and memory/attendant cards.